This first day of Les Voiles de Saint-Tropez 2017, traditionally marked by the start of competition for some 180 Modern yachts, including 14 sumptuous Wallys and the four 15 MJIs competing in the Rolex Trophy, was transformed into a ‘reconnaissance mission’ for most of the crews, as they made the most of the lack of breeze to cruise around the bay sizing up their opponents for Tuesday’s racing. Tomorrow, once everyone hits the water, the outlook is much more hopeful with a favourable westerly wind due to sweep all the race zones in the glorious sunshine synonymous with Saint Tropez. This is the third meeting of the season for the 4 majestic Fife designs, the last survivors of the 15m JI class. After the Balearics and the Monaco Classic week, the crews of Hispania, Tuiga, The Lady Anne and Mariska were itching to get going on their quest to win the prestigious Rolex Trophy, which is this year dedicated to them. 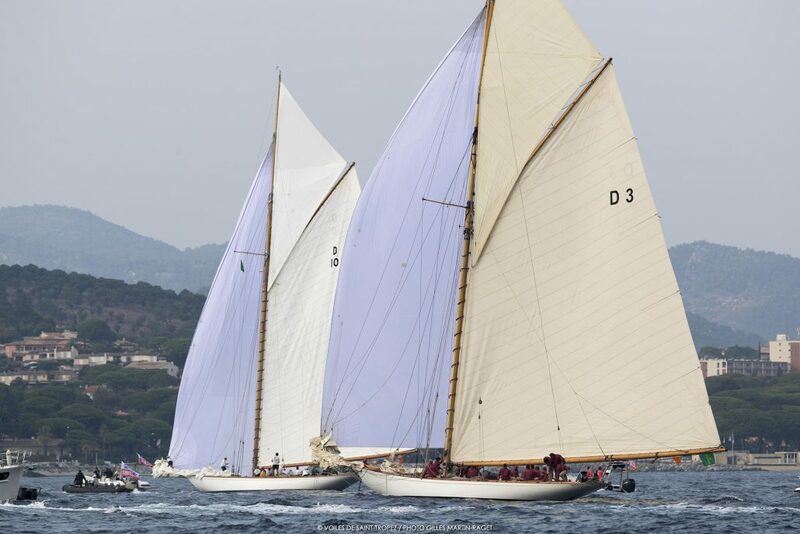 Fortunately, theirs was the only class to race today and they were treated to a windward-leeward course at the very heart of the Bay of Saint Tropez. The light airs didn’t make things easy for the Race Committee and the gaff cutters had to wait until 15:30pm to hit the racetrack in a very light 5-6-knot south-westerly wind. Mariska utterly dominates this class, as her appearance in France’s Var region bore witness, but she was under some serious pressure from The Lady Anne, 1912, and her predominantly Spanish crew that includes Pablo Santurde, one of the hot favourites in the Class40 for the upcoming Transat Jacques Vabre. The lightweight Mariska naturally took the win ahead of The Lady Anne. Classic Yachts: newcomers galore Tomorrow, Tuesday, the Classic yachts will be getting down to some action. Among the most notable newcomers is the debut appearance from the 1913 P Class Chips designed by America’s Cup genius, Starling Burgess. Helmed by Imoca sailor Alexia Barrier, it will also be the first time the 6 m JI Nada (Fife 1930) has sailed at Les Voiles. From the star category of large gaff-rigged schooners, another newcomer will be Doriana, a 38m Wedell-Wedellsborg design built in 1930 by the Frederiksund yard in Denmark, which will be sailing alongside Elena of London and Puritan. Back for more at this 2017 edition, we have the beautiful ketch Hygie (24m – Severi 1930), the Bermudan sloop The Blue Peter (19.65m – Mylne 1930) as well as the very elegant Bermudan cutter Eilidh (17.75m – Mylne 1931). If the number of participants among the classics is slightly up this year, this is also doubtless thanks to the large contingent of metre boats: 6 M, 8 M, 10 M, 12 M, 15 M and 23 M JI. Among the Modern Marconi rigs, which race in line with the same calendar as the traditional yachts, we note the arrival of the latest creation from the Latitude 46 yard, the Tofinou 10 M’Lou 2 designed for family coastal cruising. 12 Tofinous competing The Tofinous, elegant day boats made of teak and varnished mahogany, have made themselves at home at Les Voiles de Saint Tropez. Boasting a family that becomes ever larger each year, 12 boats will be representing the range between 9.5 and 12 metres. They’ll be sailing with five other yachts of the same spirit from the Black Pepper yard, the Code 0s. WALLY, the future starts here Born from the imagination and the desire of a well-informed yachtsman, Italian Luca Bassani, the Wallys precisely adhere to the criteria that guided the major naval architects of the last century. Performance, elegance, design, simplicity and comfort. In creating the Wallys, Luca Bassani wanted to be able to manoeuvre his large yacht with a much smaller crew, and even singlehanded, by using the most advanced technologies to simplify things and make the yacht easier and more fun. And so it was that the Wallys were created, combining the iconic style of this brand with the waterlines of the world’s best naval architects. 40 boats now embody this philosophy of yachting, some spanning over 24 metres in length. Today, the Wally Class is the largest division of racing super yachts in the world. The range now also extends to high-performance motor boats thanks to the « Wallypower » line and the innovative motoryacht from the Wallyace line. Over the years, Wally has become a loyal partner to Les Voiles de Saint-Tropez thanks to its pioneering spirit in a technological environment that is constantly calling itself into question. 14 craft are present this year, including the brand new Wallycento “Tango”. Pommery In 1976, Paul-François Vranken launched into the world of champagne and created the Vranken champagne brand with the aim of offering a delightful champagne for everyone to enjoy. Today, the gamble has paid off for the Vranken-Pommery Monopole group that has made its name thanks to its powerful portfolio of prestigious international brands. These include Pommery, Heidsieck & Co. Monopole, Vranken, Château La Gordonne, Rozès and others. As Europe’s leading wine grower, the group has an exceptional heritage spanning different appellations and regions, such as Champagne, Provence, the Camargue and Douro. These regions are producers of high quality wines from which each brand draws on its image, its resources and its roots. Suzuki is further strengthening its involvement in watersports activities by going into partnership with the Société Nautique de Saint-Tropez for the next three years. Suzuki is providing its partners with a series of outboard engines for a fleet that ensures the supervision and safety of its activities. This series includes engines from the portable range with the DF20A, the sports range with the DF90A and DF40A, as well as the performance range with the DF200APX. In light of this partnership, Suzuki is present at the 19th edition of Les Voiles de Saint-Tropez. In Les Voiles’ prestigious race village, located on the Esplanade du Port, Suzuki Marine is welcoming the public in a dedicated space. Suzuki Marine will also be awarding a Trophy during the prize-giving ceremony, which will take place on Sunday 8 October. “We’re delighted by this collaboration with the Société Nautique de Saint-Tropez. By becoming a partner, Suzuki Marine will benefit from visibility in a whole new context. Together with the Société Nautique de St-Tropez, we share the same values of enthusiasm, solidarity and performance, supported by a rich history. As such this partnership was an obvious step forward,” explains Christophe Vassas, Director of the company’s Marine business. http://www.lesvoilesdesaint-tropez.fr/les_voiles_de_saint_tropez/wp-content/uploads/07-VST17-D2_0657.jpg 1417 2126 SNST99@beauVAR-83 http://www.lesvoilesdesaint-tropez.fr/les_voiles_de_saint_tropez/wp-content/uploads/vdst2017siteOK.png SNST99@beauVAR-832017-10-02 23:33:572017-10-02 23:33:57Saint-Tropez holds its breath! Saint-Tropez retient son souffle ! Le miracle permanent des Voiles !